Millions of people around the world want—and deserve—a better education. Here are some tools to improve opportunities for all. Innovations in technology continually change the way people learn. And now, in an age when mobile-broadband networks reach nearly 85 percent of people around the world, technology is democratizing learning in developing countries—especially for youth and those living in rural areas. For EDC’s Steve Anzalone, who has spent his career at the intersection of technology and education, the most transformative technologies engage learners, enhance the learning process, and are practical and cheap to deliver. So what tools will make the biggest difference over the next decade? Anzalone offers three technologies that are already transforming learning for billions. Anzalone is most interested in technologies that can reach the greatest number of learners, so interactive audio instruction (IAI) remains at the top of his list. “Radio and other low-cost audio setups are still unmatched as tools for delivering education,” he says. EDC has used IAI with great success in many developing countries where the need for high-quality education is great, but the teaching workforce is weak. Anzalone likes IAI because it is a flexible and robust way to deliver content. Lessons can be disseminated over broadcast radio or via podcasts or sent directly to mobile phones when an Internet connection is unavailable. But it’s not just the reach of IAI that makes this technology so powerful, it’s also the ability to develop and distribute high-quality lessons that improve both students’ learning and teachers’ teaching skills. Participating on social media sites such as Facebook and Weibo may never replace a formal education, but Anzalone feels that they have a significant role to play in offering informal learning opportunities to millions. Increasing the range of informal knowledge that students bring with them to the classroom will have big benefits. 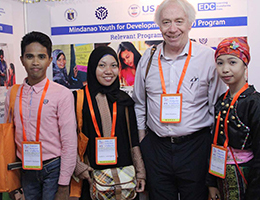 Anzalone’s thinking is inspired by his trips to education and workforce development projects in Southeast Asia, where he has met hundreds of young people who use social media to learn new skills, network with peers and prospective partners, and advertise their entrepreneurial ideas. As the cost of shooting, producing, and sharing video has gotten cheaper, video-enhanced educational opportunities have skyrocketed (think Khan Academy or any of the hundreds of do-it-yourself channels on YouTube). Access has also expanded, with videos available for viewing across multiple platforms—including televisions, laptops, tablets, and even mobile phones. The increasing availability of video is one reason why Anzalone thinks that it is poised to be a transformative technology over the next few decades. Another reason? Research has proven that video is a powerful tool for modeling, analysis, and reflection. Anzalone saw this firsthand in Lesotho in the 1970s, where he used video to support teacher training initiatives, showing teachers recordings of themselves leading a class. It was an experience that helped many teachers improve their practice—and a project that left a lasting impression on him. But, he cautions, video can only be transformative if it makes a measurable difference in learning. And that is where video has yet to reach its full potential.